A facelift is a form of cosmetic surgery that changes a person's appearance by aiming to reduce lines, wrinkles and other visible signs of ageing. While your face might be less lined and possibly appear more youthful after the operation, a facelift doesn't stop the ageing process. taking fat from other parts of the body, such as the abdomen, and putting it in areas like the cheeks. A facelift is also known as a meloplasty or rhytidectomy. Many people feel a great deal of pressure to appear youthful. But a facelift is not the solution for everyone, and there are alternatives. Ageing is a natural process and you don't need to have an unlined face to get work, be respected or to attract a partner. Anyone having any major cosmetic surgery (involving cutting beneath the skin), including a facelift, needs to see the surgeon before scheduling any surgery, and needs to wait through a compulsory cooling off period before the surgery can take place. The treating doctor is satisfied that the person thinking about having cosmetic surgery is in good psychological health. If the doctor is unsure about this, and it may affect the person's suitability for a facelift, they need to refer them for an independent psychological assessment. Consider whether you can afford a facelift and if it will give you the results you expect. Medicare doesn't cover the cost of cosmetic surgery and generally private health insurance doesn't either. If the facelift is done as part of a procedure to correct deformities or treat traumatic injuries, some of the cost might be covered. Discuss the costs with your surgeon. You might want to explore non-surgical options such as dermabrasion and injectables like collagen or Botox. Sunburn protection will prevent further skin damage and protect you from cancer. A facelift might boost your self-esteem. However, behavioural therapy (including cognitive behavioural therapy) is a better way to treat psychological conditions such as depression and body dysmorphic disorder. won't remove deep frown lines on your forehead or wrinkles around your mouth, and it won't raise sagging eyebrows. Healthdirect has more information about cosmetic surgery in general. If you are considering a facelift, it is important to choose a surgeon you feel comfortable with, and who will speak to you honestly about the benefits and risks of any surgery. The Australian Health Practitioner Regulation Agency (AHPRA) has a register of medical practitioners. You can check this register to ensure your surgeon is a Fellow of the Royal Australasian College of Surgeons (RACS). You can also check if the surgeon has had any serious disciplinary action taken against them. Some people consider having cosmetic surgery overseas, but there can be many problems with this. What are the risks of this operation for a person in my state of health? How many facelifts have you performed? How often is a second procedure required? Can you show me before and after photographs of other patients? How long is my recovery likely to take? You can also use the Question Builder tool to create your question list for the appointment. Prepare your list, then print or email it so you remember what you want to ask. Your surgeon will need a full medical history and will discuss your expectations. Take notice of any pre-surgery instructions. What happens during a facelift procedure? The type of facelift procedure you have will depend on what you have agreed with your surgeon. You will be given a local or general anaesthetic. Full or traditional facelift: The surgeon is likely to make an incision that follows your hairline from the temples, around the ears and down to the lower scalp. If needed, a small incision may also be made under your chin to give access to the neck. The surgeon will then raise the skin away from the face and reposition the underlying muscle and tissue. They might remove or redistribute facial and neck fat. Sometimes fat collected by liposuction from elsewhere in the body, such as the abdomen, may be used to plump up the cheeks or other parts of the face. The surgeon redrapes the skin over the face and neck and trims any excess skin. They sew, clip or tape the incisions up and apply a dressing. Sometimes a small thin drainage tube is placed under the skin to remove excess blood or fluid. Mini or limited incision facelift: This operation is a minor variation of the full facelift, with shorter cuts around the hairline. Additional cuts may be made in the lower eyelids or under the upper lip. Neck lift: This operation focuses on removing fat and sagging skin in the neck area. The incisions will probably be done around the ears and under the chin. 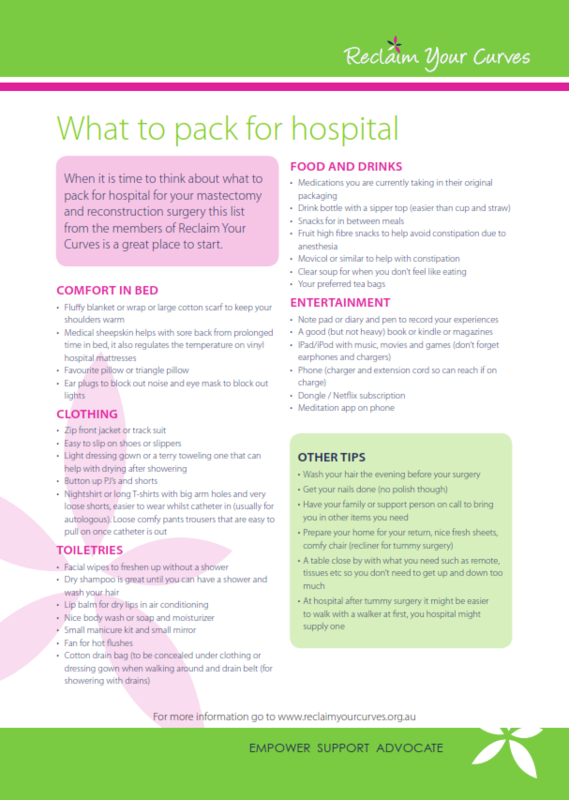 You might be in hospital for a short stay – read about what to pack – or you might have a day procedure. The day after surgery, the doctor is likely to remove any drainage tubes and put fresh dressing on the wounds. You will need to return to have the stitches taken out, usually after a week. You are likely to have pain, bruising and swelling around the site of the operation. Your doctor may prescribe pain relief medication. Sleep with your head elevated to reduce the swelling. pain not controlled by prescribed pain relief medication. Like any surgery, a facelift procedure comes with risks. You should discuss the risks in detail with your surgeon. You should also discuss the risks of anaesthetic with your anaesthetist. You might also need a revision of the operation to correct complications. possible further costs for additional revision surgery or treatment. If you are considering a facelift, you should first discuss it with your doctor. More information is also available on the Australasian Foundation for Plastic Surgery website, and in our guide to cosmetic surgery.